Anti-fungal, bacteria resistant, highly absorbent – if you want your children to have healthier feet, it seems like bamboo is the way to go. 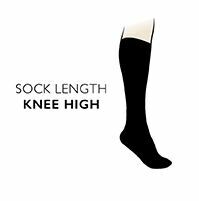 To take advantage of those superior characteristics, we’ve made these SockShop Plain Bamboo Knee High Socks, using beautifully soft and silky bamboo fibre. Bamboo’s fibre structure gives it excellent temperature control abilities, keeping your child’s feet cool in warm weather and amazingly, comfortably warm in colder temperatures too. making these socks even better, we’ve given them Comfort Cuff tops that don’t hurt little legs and proper hand linked toes for smooth seams that don’t rub small toe joints.